It's a midrange phone with high style and serious specs. Ever since HMD Global became the home to Nokia-branded phones in 2016, only a few of those handsets have made their way to the US. But that hasn't slowed down the company's ambitions. Today, HMD Global is set to announce one more Nokia handset for the American audience. It's the Nokia 7.1, a mid-range phone with high-end sheen, and it'll be available for only $349. 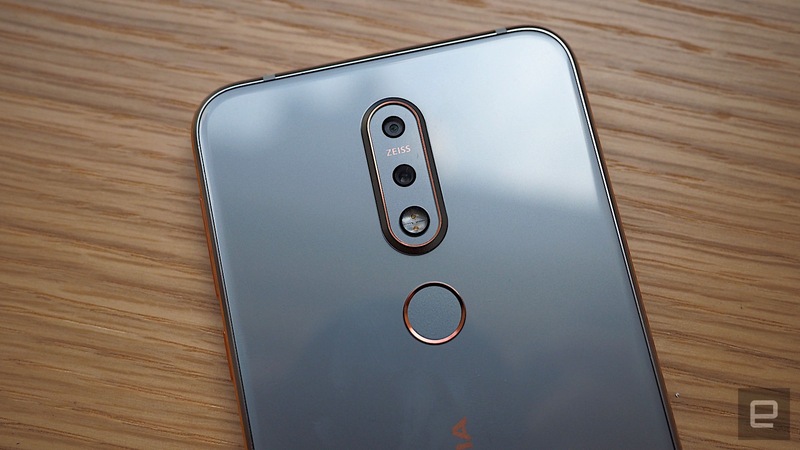 The Nokia 7.1 is essentially a second-generation iteration of the Nokia 7, which was a China-exclusive when it first launched. The 7.1, however, will be available globally, and is remarkably more polished than its predecessor. The front and back are clad in a mirror-finish glass (with an 85 percent glass surface area) and the aluminum frame that holds it all together is a single piece of extruded metal. Measuring 5.89 by 2.8 by 0.31 inches (149.7 by 71.18 by 7.9mm), the Nokia 7.1 is neither too big nor too small and feels relatively lightweight -- the phone fits in my small hands very comfortably. The phone comes in both Gloss Steel (grey body, copper accents) and Gloss Midnight Steel (blue body, silver accents). The surrounding aluminum frame has been given a two-tone anodization treatment, which brings out different silver and copper tones in the metal. On the front is a 5.84-inch full HD display, and yes, there is a notch, like many smartphones these days. According to Nokia, the 7 is the first to feature the patented "PureDisplay" technology (which HMD bought back from Microsoft) that brings improved color, contrast and dynamic range to the phone's display. It also touts HDR 10 native support, and movies and photos can be upscaled from SDR to HDR, which would make them sharper and more colorful. What I especially liked was the adaptive display capability, where it'll adjust the brightness, color tone and overall luminosity of the screen depending on lighting conditions and your usage of the phone. Despite the aforementioned specs though, the screen is also where the phone begins to betray its mid-range bearings. It's certainly colorful and sharp enough for a sub-$400 phone, and the HDR is commendable, but the display is simply nowhere as seamless and smooth as handsets that are twice its price. The resolution is rather lackluster and images have slightly fuzzy edges, at least in the few minutes that I had playing around with it. One feature that Nokia is especially proud to mention with the Nokia 7.1 is there are now dual cameras on the back. There's a 12-megapixel f/1.8 camera as well as a 5-megapixel lens for depth-based imaging. Both cameras are outfitted with Zeiss Optics. Features include fast autofocus, HDR photography, and a Pro Camera UI mode that lets you adjust individual settings like brightness and white balance. A new feature on the 7.1 is live bokeh, which makes it possible to adjust focus and blur of a subject's background in real-time. Nokia introduced the "Bothie" concept to its phones a year ago, and it's back again in the 7.1. 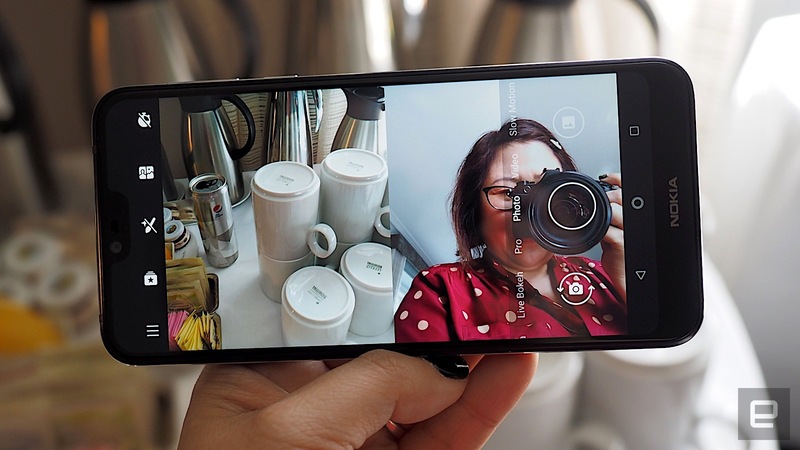 As a refresher, this basically means you can capture photos and videos using both the front-facing and rear-facing camera at the same time, in a split-screen mode. One of the more popular use cases of such a feature is livestreaming via Facebook or YouTube, like if you're at a concert for example, and you want to take a selfie and show what you're watching. On the 7.1, however, Nokia has introduced a couple of advanced "Bothie" controls. For one thing, that aforementioned split-screen mode is no longer divided in just 50-50; you can slide the viewfinder up or down to show more or less on either side. You can also now freeze one of the frames while continuing to stream on the other. And, of course, the Bothie camera now comes with selfie face filters and masks to add even more kawaii tomfoolery to your livestreaming sessions. As far as internals go, the Nokia 7.1 has a Qualcomm Snapdragon 636 processor, which deliver pretty solid performance for a mid-tier phone like this. During my brief hands-on time with the phone, I didn't experience much stutter or lag as I swiped through the menu and launched different apps. The camera did experience a couple of hiccups when switching modes, however, which could've exposed some of the limitations of the 636. It comes with a 3,060mAh battery, a USB-C charging port and a 3.5mm headset jack, which should please those of us who've clung onto our wired headphones. There's a finger-print sensor on the back as well. Software-wise, the Nokia 7.1 ships with Android Oreo, but will support the new Android Pie in November. The phone is in Google's Android One program, which promises a pure Android experience without any skins or overlays. 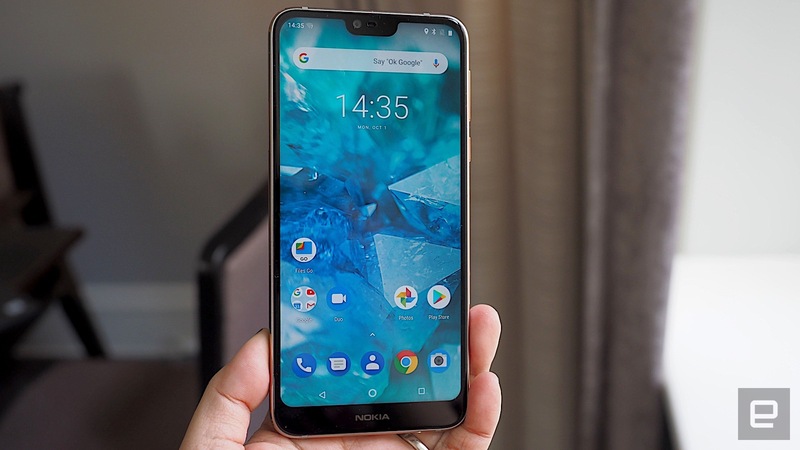 Seeing as HMD Global has already released two other Nokia phones in the US recently -- the Nokia 6.1 and 3.1 in the past few months alone -- the addition of the 7.1 shows that the company is getting ready for a bigger push into the US market. It's unclear if we'll ever see high-end models like the Nokia 8 Sirocco or the much-fabled five-camera handset make their way stateside, but if phones like the 7.1 sell well, HMD Global certainly has a bigger incentive to get that going. There'll be two versions of the Nokia 7.1; one with 32GB storage that will retail for 319 euros, and another with 64GB storage that will retail for 349 euros. Both models will be available on the global market, but the US will only see the 64GB version (for the aforementioned $349). You'll be able to buy one from Amazon, Best Buy or B&H. Pre-orders will begin on October 5th and units will start shipping on the 28th. Or, if you want to try it out yourself before buying one, they'll be set up in special Nokia display areas in Best Buy locations across the country starting on November 4th.